The journey to the Scottish Cup final may be known as the Road to Hampden, but for Raith Rovers the competition begins at the national stadium on Saturday. The Kirkcaldy side will face League Two outfit Queen’s Park in a third round tie as John McGlynn returns to a venue that holds cherished memories from his first spell in charge. It was at Hampden that McGlynn’s Rovers clinched the old Second Division title in 2009 with a 1-0 win over Queens Park on the penultimate day of the season. McGlynn returned a year later to lead his team out in a Scottish Cup semi-final, the club’s first appearance at that stage in 47 years, which resulted in a 2-0 defeat to Dundee United. 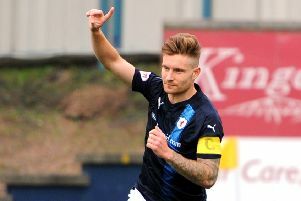 Raith have crashed out at the first hurdle in each of the past two seasons but McGlynn is hoping he can call on the spirit of 2010 and embark on another cup run adventure. “I’m not getting carried away and thinking we can get to a semi-final again, but a cup run would be a massive boost to the club financially, and to the players,” he said. “The potential is that you could be playing a televised game against one of the big clubs in the next round, then you’re in the shop window and all eyes are on us. “It could be start of something big, we hope it is, but we certainly have to take care of Queens first and foremost. “They’ve got Mark Roberts in as manager after Gus McPherson left for St Mirren and their results have been very good, even beating Peterhead not so long ago at home. After missing five regular starters last weekend, Rovers are hoping to welcome Grant Gillespie and Chris Duggan back into the squad from long-term injury, while Nat Weddeburn returns from suspension. “Grant and Chris are training but they have to get through this week without any reaction,” McGlynn said. “We’ll have a better idea on Friday if they are available for selection, but they are on course. “These guys been out a long time, so they are not going to be right up to speed and on top of their form so there’s a decision to be made there over whether they they will be up for starting. There is a fresh injury concern, however, regarding left back Callum Crane, who looks set to miss the next few weeks with a knee strain picked up in Saturday’s win over Stenhousemuir, a game which saw him score his first goal for the club since joining on loan from Livingston. McGlynn praised his players for grinding out the three points at Stenhousemuir last week in spite of the extensive absentee list. “It’s vital that, even with all these players missing, we still won the game,” he said. “That shows character. The pitch there is not the best, and Stenhousemuir have got a caretaker manager in who is getting everything from his players.